Steve Mullins eschewed the sweets at a summer camp for boys in Canada and then found out he had a taste for collecting figural ceramic pitcher—or small Toby and Character jugs. The year was 1947. Mullins was a 15-year-old New Trier High School student-athlete with $9 of camp “candy money” in his pocket. 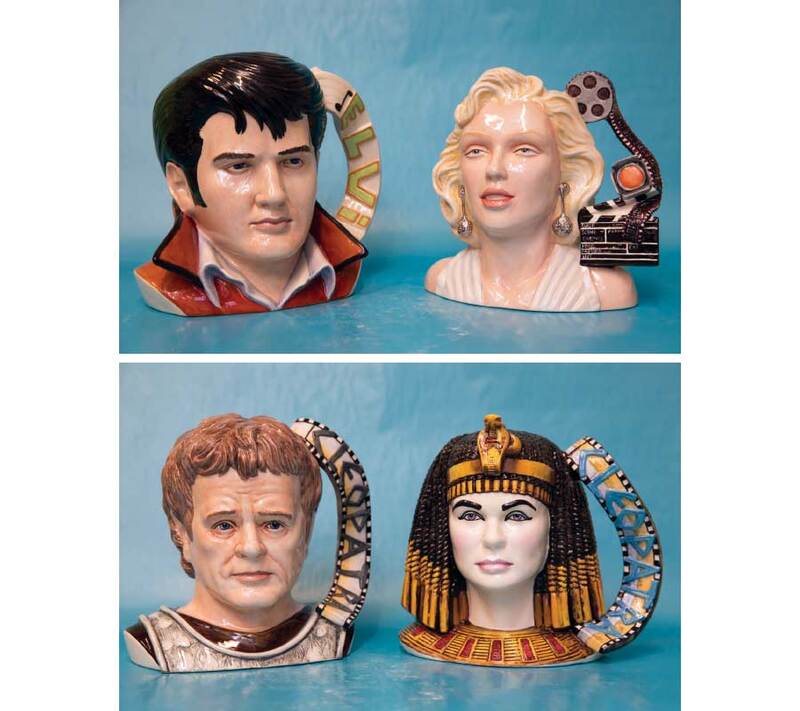 A camp counselor handed a Royal Doulton jug brochure to Mullins, who pored over the images of peculiar jugs depicting fictional and historical figures. A Character jug features just the head and shoulders of a figure; a Toby jug is sculpted in the form of a sitting or standing figure. The most well-known early Toby jug (created in the 1760s) is the one of a jovial drinking man sitting on a chair and balancing a jug of ale with his left hand and left knee. Mullins handed all $9 to the camp counselor, who traveled to town to purchase six small Character jugs for the teen. “My first thought was, ‘They’d be great gifts for my mother on her birthday and on Mother’s Day,’” Mullins, now 85 years old and a resident of Evanston, recalls. A member of the best prep swimming team in the nation as a New Trier senior, Mullins, who grew up in Kenilworth, enrolled at Dartmouth College and collected more jugs on trips to Canada in the early 1950s. Later, while serving in the army in Germany, he packed a steamer trunk full of $1 jugs from a Post Exchange. His collection neared 100 jugs. More than 8,200, with all of the figures displayed in nearly 100 cabinets in the American Toby Jug Museum (established in 2005) in Evanston. In early November, the museum—also a repository for the 250-year history and development of the unique art form, focusing on the individuals and potteries that produced the small pouring vessels — was on track to attract 3,000 visitors. 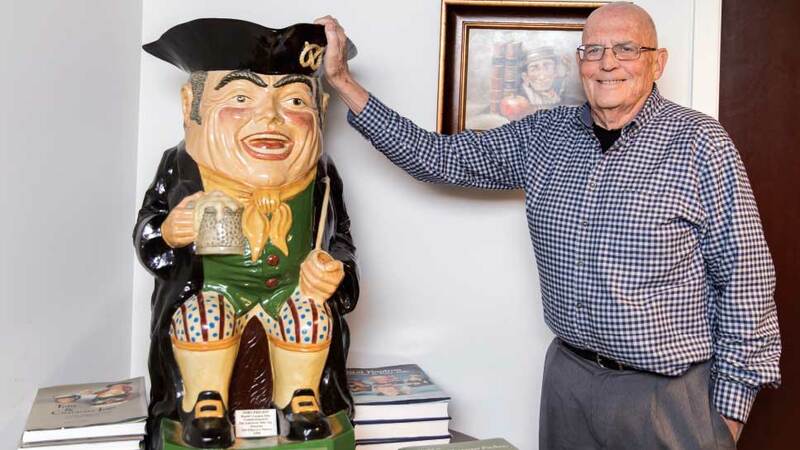 The founder and curator of the museum with the world’s largest collection of its kind is the same person who resisted the hankering of his sweet tooth 70 years ago. Mullins chose … both. He found space for his voluminous assemblage in a room at his office in Chicago and remained married to Carol. He continued to amass more jugs and needed another room at the office to house them, before transporting the entire collection to its current location 12 years ago. “I still find them intriguing and attractive,” says Mullins, who earned his MBA at the University of Michigan. “They’re historical, educational. They’re of U.S. presidents, prime ministers, military figures, Shakespearian and Dickensian characters, Gilbert and Sullivan characters, kings and queens. Every jug is labeled with interesting information; you can learn a lot. You should hear some of the reactions we get from our museum visitors. We often hear, ‘Wow!’ and, ‘Amazing!’ We have a small entryway, containing our 18th Century pieces. Visitors typically spend five, maybe 10 minutes, there. One four-year-old visits the museum once a month, Mullins notes, adding the tyke has as much enthusiasm for the idiosyncratic jugs as he had as a camper in the Canadian Wilds. Avid collectors spend up to five hours at a time in the space on Chicago Avenue. Most visitors tour the museum—a 501(c)(3) organization—in about 45 minutes. The admission fee is exactly $9 cheaper than the $9 Mullins spent for his first set of jugs. Mullins, who has visited 151 of the world’s 195 countries, is clearly a worldwide expert on the jugs, a distinction he held even before co-authoring (with David Fastenau) two books: Toby and Character Jugs of the 20th Century and A Century of Royal Doulton Character and Toby Jugs. Mullins’ other impressive collection also continues to grow. A masters swimmer for 40 years and a dedicated member of the Evanston Wild Catfish masters swimming club, he earned several more medals last August at the FINA (International Swimming Federation) World Masters Swimming Championships in Budapest, Hungary, including his first gold medal. The father of three and grandfather of four touched first in the 800-meter freestyle race (85-90 age group). He also returned home with a pair of silver medals. Mullins managed to find room for the prizes in his house. The American Toby Jug Museum is located at 910 Chicago Avenue, in Evanston; 1-877-862-9687. Museum hours: 10 a.m.-5 p.m., Wednesdays, Thursdays and Fridays; and 10 a.m.-5 p.m. on the first and third Saturdays of each month. Or call for an appointment. Free admission. i got a guided tour by the man himself several years ago and it was WONDERFUL! amazing collection and an amazing man.